Why Did I Go Into Atrial Fibrillation? Most patients would like to have a reason for why their atria suddenly decided to fibrillate. It’s understandable. If they could identify the reason perhaps they could stop it from happening again. “Atrial fibrillation is associated with getting older and having high blood pressure. 10 % of individual >/= 80 years have atrial fibrillation. 90% of patients with afib have hypertension. Aging and hypertension may increase scarring or damage in the left atrium or pulmonary veins that drain into the left atrium setting up abnormal electrical signals. There are some specific things that cause afib and we will be doing a complete history and physical and some testing to check for the most common. We’ll check you for thyroid or electrolyte abnormalities and we will do an echocardiogram to look for any structural problems with your heart. If we do find a treatable cause such as hyperthyroidism or a cardiac valve problem we will fix that and the afib may go away, however chances are we won’t find a specific reason why you developed atrial fibrillation. If you’d like a more sophisticated look into what causes afib take a look at this graphic from a recent paper. 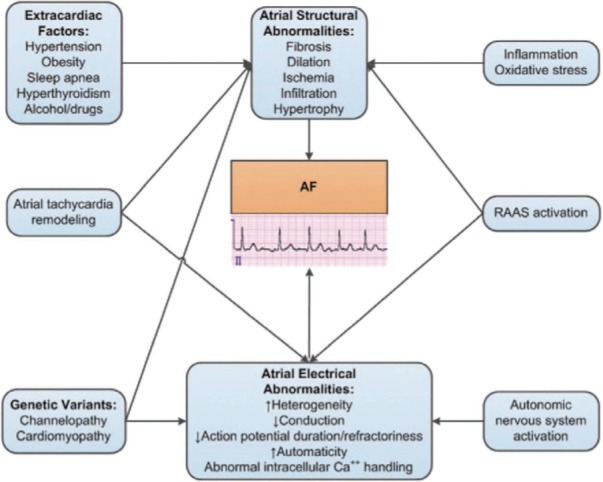 Current theory has it that factors that we know are associated with atrial fibrillation including obesity, hypertension and sleep apnea cause atrial structural abnormalities or remodeling which then create various atrial electrical abnormalities. Both of these mnemonics are a little outdated. For example, rheumatic mitral stenosis is quite rare as a cause of afib in the US but degenerative and functional mitral regurgitation is a common cause. Ischemic heart disease (aka coronary heart disease) isn’t felt to cause atrial fibrillation unless it results in a myocardial infarction and subsequent heart failure. Way too many cardiac catheterizations are performed on patients who present with atrial fibrillation by doctors who don’t know this. There may be case reports of pheochromocytoma (a catecholamine-secreting neuroendocrine tumor) causing afib but they are few and far between. Finally, genetics clearly play a role in the younger patient with afib without any known risk factors. One of my patients and his twin brother both developed symptomatic afib in their 40s. In The Chronic Afibber What Triggers An Episode? Alas, for most afibbers we won’t identify specific reasons why you go in and out of afib although there are some triggers you should definitely avoid such as excessive alcohol. Some of the “causes” listed in the mnemonic are acute triggers of afib episodes. And I have definitely seen patients go into atrial fibrillation who have acute pulmonary problems such as pneumonia, pulmonary embolism or exacerbation of COPD. In these cases, it is felt that the lung process raises pressure in the pulmonary arteries thereby putting strain on the right heart leading to higher right atrial pressures. Sleep apnea is associated with afib and I have had a few cases where after identifying that a patient’s afib always began during sleep we were able to substantially lower episodes by treatment of sleep apnea. Pericarditis with inflammation adjacent to the left atrium not uncommonly causes afib. This is the likely mechanism for the afib that occurs frequently after cardiac surgery. Since pericarditis may never recur (especially in the cardiac surgery patient) we think the risk of afib recurring is low in these patients. Anything that raises stress and stimulates the sympathomimetic nervous system can be a trigger. For example, a young and otherwise healthy patient of mine went into afib after encountering a car in flames along the side of the road. We found that beta-blockers (which block the sympathetic nervous system) helped prevent her episodes. Some patients have odd but reproducible triggers. One of my patients routinely went into afib when he ate ice cream. I had a simple , very effective treatment plan for him. Many afibbers have been told to avoid caffeine but a recent study of 34,000 women found that there was no increased risk of afib with increasing caffeine content and no sign that any of the individual contributors to caffeine in the diet (coffee, tea, cola, and chocolate) were more likely to cause afib. Higher chocolate consumption, in fact, has recently been linked to a lower rate of afib. An observational study of 55 thousand Danish men and women found that those who consumed 2 to 6 servings per week of 1 oz (30 grams) of chocolate had a 20% lower rate of clinically apparent afib. Binge drinking has long been known to cause acute atrial fibrillation. However, it appears that even light to moderate chronic alcohol consumption increases the risk of going into atrial fibrillation. The review concludes that although light to moderate alcohol consumption lowers your risk of dying, any alcohol consumption increases your risk of afib. This graph shows the relationship between dying from heart disease (red line) and risk of going into afib (blue line) and amount of alcohol consumed. 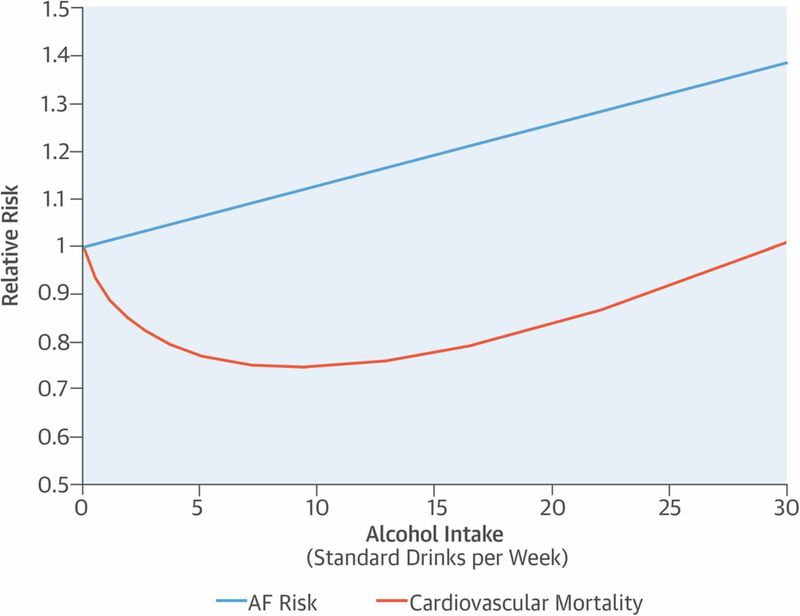 Looking at the 15 drinks per week point on the x-axis (about 2 drinks per day) we see that your CV mortality is reduced by 20% whereas your risk of afib has increased by 20%. A better point on the x-axis is 7 (1 drink per day) which has a 25% lower CV mortality but only a 10% higher risk of afib. Whatever caused you to go into afib the good news is that with lifestyle changes and the care of a good cardiologist chances are excellent that you can live a normal, happy, healthy , long and active life. The most effective method for getting a heart that is in atrial fibrillation back to normal rhythm is a called an electrical cardioversion. I’ve tried to come up with a good alternative or descriptive term for this procedure for my patients, such as “resetting” or “rebooting” the heart, but the term that seems to best resonate with patients is “shocking” the heart. How Does Electrical Cardioversion Work? Typically, we all can connect (excuse the pun) to the feeling of a low current electrical shock which occurs when touching an ungrounded electrical source. Unless the current reaches a certain level, it only results in transient burns and discomfort. However, at current levels greater than 50 mA, an AC electrical shock traveling through the chest can, if timed properly, cause the heart to go out of normal rhythm into ventricular fibrillation. We use a “synchronized” electrical cardioversion (termed direct current or DC cardioversion (DCC)) to convert a fibrillating or fluttering atrium back to the normal rhythm by timing the electrical shock so that it doesn’t cause ventricular fibrillation but resets both ventricles and atria safely back to normal. Recording from a recent cardioversion I performed on a patient with recurrent atrial flutter/fibrillation associated with heart failure. On the left is the heart rhythm before the shock, and on the right we can see resumption of normal sinus rhythm. The little squiggles labeled p waves represent the electrical activity of the sinus node preceding the big vertical deflections, which represent the electrical activity of the ventricles (QRS). The circled little arrow shows the timing of the shock concurrent with the QRS complexes. If the timing is not correct, the shock can cause ventricular fibrillation. This may seem like a barbaric and unnecessarily crude and dramatic way to restore normal rhythm, but if patients are properly prepared for this procedure, it is very safe and very effective, resulting in resumption of the normal rhythm 99% of the time. There are some medications that we can utilize to convert atrial fibrillation (afib) back to normal (antiarrhythmic drugs), but they are far less effective than the electrical cardioversion, and often can bring out more dangerous heart rhythms. Typically, I do my cardioversions in conjunction with an anesthesiologist, who administers IV propofol (yes, this was Michael Jackson’s sleep aid, his “milk”) to obtain “deep sedation.” At this level of anesthesia, the patient is breathing on his own but will only respond to painful stimulation. The propofol is short-acting and prevents the patient from feeling the intense pain of the cardioversion (often described as like a mule kicking one in the chest), and from recalling any of the events. The skeptical cardiologist calmly prepares to push the “shock” button that will trigger the Zoll device to deliver 150 Joules of biphasic direct current to the electrodes attached to his patient’s chest thereby “ZAPPING” her back to NSR. Should the patient’s heart rhythm be too slow, the Zoll device also can serve as an external pacemaker, triggering cardiac contractions via lower level electrical currents delivered through the chest electrodes. The electrical shock is administered through electrodes, consisting of large sticky pads with electrical conducting gel attached to the right anterior chest and the left posterior back (see this brief information from Zoll about optimal placement). Since I began using “biphasic” energy, the initial cardioversion is successful >95% of the time in my experience, but the heart may revert back to atrial fibrillation anywhere from a few minutes to a few years after the shock. We can reduce the chances of reverting back by the use of anti-arrhythmic drugs. Multiple Shocks: What Is The Limit? The DCC may need to be repeated, and we may repeat it after starting one of those anti-arrhythmic drugs I mentioned, in order to increase the time that the heart stays in the normal rhythm. One might think it is one and done with the shock but it is not a cure; it is merely a resetting of the chaotic, confused and futile activity of the atria, so that the synchronized and regular electrical pacing provided by the sinus node in the upper right atrium can again resume its rightful role as conductor of the cardiac electrical orchestra that creates the wondrous symphony of normal cardiac contraction. There is no evidence that the cardioversion per se damages the heart in any way. The major risks of the procedure (again, assuming proper preparation, see below) are related to the anesthesia. I am more inclined to recommend a repeat cardioversion if there is clear-cut evidence that the patient does poorly when the heart is in afib. In medicine, there are two reasons for giving medications and doing surgery/procedures: to make the patient feel better or to reduce the chances of dying/having a major complication. The major complication of afib is stroke. Proper anticoagulation is required to prevent this in patients with afib whether or not they are in normal rhythm. Clots can form in the left atrial appendage within hours of the development of afib, and the electrical cardioversion can increase the chance of stroke as any clot present is more likely to be expelled when the quivering, ineffective atrium converts back to a normally pumping, vigorous atrium. Primarily, then, we utilize cardioversion for the purpose of making patients feel better. Some patients feel terrible the moment they go into afib: symptoms of palpitations, chest pain, or shortness of breath predominate and are especially prominent if the heart rate is high. Controlling the high heart rate with beta-blockers or diltiazem will reduce many of these symptoms, but I have a large number of patients who still feel terrible when they are “out of rhythm,” even if the heart rate is normal. Such patients who persist in afib are good candidates for one or multiple cardioversions, with or without the addition of anti-arrhythmic drugs. A second group of patients, I think, benefits the most from maintaining sinus rhythm (rhythm control strategy): patients who develop heart failure when they go into AF. These patients may not even know they are in AF because they don’t feel the typical symptoms initially. After a few days or weeks or months of being in afib silently, however, they develop shortness of breath, weakness and leg swelling – classic signs of heart failure. When we look at the heart of such a patient by echocardiography, we often find one of two things causing the heart failure: a weakening of the heart muscle (cardiomyopathy) or significant leakage/backflow from the mitral valve (mitral regurgitation). Following cardioversion and maintenance of SR for weeks to months, the heart muscle strengthens back to normal and/or the mitral regurgitation improves dramatically and the heart failure resolves. Yesterday I did an electrical cardioversion on an elderly patient of mine for atrial fibrillation/flutter; this was her fifth DCC in the last year. She falls into the second category of afib patients; she had developed severe heart failure due to mitral regurgitation after silently going into afib a year earlier. After long-term loading on the anti-arrhythmic drug amiodarone, followed by her fourth cardioversion, she had stayed in NSR for 10 months, her MR resolved, and she felt great. In patients like her, I think it is particularly important to maintain NSR and thus, multiple shocks are definitely warranted. On the other hand, if you feel fine in afib without any evidence that it is effecting your heart muscle or valves, then it is hard to justify multiple attempts to shock the heart. Credits-Life Coach of the Skeptical Cardiologist (LCOSC) for review of electrical engineering stuff. When I talk to my patient with newly diagnosed atrial fibrillation (AF), after describing the disease and its consequences, there are two major discussions I go through. The first involves the fact that AF increases the risk of clots forming in the heart and subsequently going to the brain to cause stroke. The second involves whether we should try to keep the patient from going into atrial fibrillation or, if they are in it continuously, whether we should try to convert them back to the normal (sinus) rhythm. If this is the first time the patient has had the AF, these are pretty complicated concepts to absorb and difficult decisions to make . When the heart goes into AF the left upper chamber or left atrium immediately stops pumping blood in an organized and synchronized fashion. Several factors increase the risk of stroke in patients with AF: older age, diabetes, heart failure, and prior stroke or TIA. Based on large population studies we can assess that risk fairly well. Multiple well done studies have demonstrated that blood thinners such as warfarin or four newer agents will reduce that risk by up to 70%. If your risk is over 2-3%/ year for stroke, the benefits of stroke reduction outweigh the risk of bleeding that all blood thinners possess. Some patients with AF are in it persistently and some go in and out of it. For both kinds of AF patients a decision has to be made about whether the goal is to maintain the normal rhythm (this is termed rhythm control) or not (this is termed rate control). If the decision is to pursue rhythm control then options for this goal include medications termed antiarrrythmic drugs, catheter-based ablation or surgical approaches. If the decision is to not maintain NSR, then we look carefully at the heart rate of the patient with AF (which tends to be much higher than normal ) and add medications (rate-controlling medications) to lower it into the normal range. For both strategies, it is important to be very cognizant of stroke risk and treat accordingly. The approach taken in any patient depends on age, symptoms associated with the AF, the presence of other diseases that increase the risk of intervening and multiple other factors. There tends to be a huge variability in how cardiologists approach the decision of rate versus rhythm control. Patients are well advised to ponder carefully their options, recognize bias in recommendations, and be very aware of the complications of all treatment recommended.